The NBA Finals coaches had their paths shaped by the conflicts of the Middle East, albeit on very different sides of the barbed wire. The 2015 NBA Finals coaches, Steve Kerr of the Golden State Warriors and David Blatt of the Cleveland Cavaliers, have both reached this summit in their first year on the job, but that’s not all they share. The two rookies are also bonded by histories intimately tied to the conflicts that plague the Middle East. In an NBA Finals where children at press conferences have generated endless hot takes, this history has been discussed, if at all, in a remarkably shallow fashion. What went unmentioned by Van Gundy, not to mention The Plain Dealer, are the ethical implications of an NBA coach beaming about his friendship with Netanyahu. “Bibi’s” last campaign was so riven with virulent anti-Arab racism, it was condemned across the globe. The aforementioned Israeli newspaper Haaretz printed an editorial about feeling “shame” that their “prime minister was a racist” after Netanyahu’s March election victory. The New York Times editorial page credited his triumph to a “desperate and craven” campaign that relied on a “racist rant” against Arab citizens of Israel to pull out a victory. Time’s Joel Klein wrote that Netanyahu’s victory represented an “appalling irony” that “brought joy to American neoconservatives and European anti-Semites alike.” I use these examples because they represent how even staunch supporters of Israel were nauseated by Netanyahu’s toxic political platform. While David Blatt thinks nothing of broadcasting his friendship with someone who has come to power on a crest of “anti-Arab bigotry,” Steve Kerr arrives from much different stock. The basics are widely known: His father, Dr. Malcolm Kerr, was killed in 1984 by two unknown assailants (with responsibility later taken by the group Islamic Jihad) while he was serving as president of The American University of Beirut. Few know, however, that Dr. Malcolm Kerr wrote what is considered a work of genius, the foundational text of Middle East politics in the ’60s, The Arab Cold War, or that he is the author of the celebrated book Islamic Reform, which profiles the most influential Muslim modernists of the early 20th century. Even fewer probably know that the Middle East Studies Association, an academic organization of over 2,700 academics, names its annual award for the best dissertation after Dr. Kerr. This same Middle East Studies Association has voted overwhelmingly to debate the boycotting of Israeli institutions in the aftermath of the Gaza war. Dr. Malcolm Kerr sought the position as president of The American University of Beirut despite the civil war plaguing the country because he believed that understanding and education could end conflict. This has impacted his son. While one could understand how his murder could have turned Steve Kerr against this way of thinking, the lessons of his father have become embedded in Coach Kerr. Over this last decade of US war in the Middle East, Kerr has made comments such as, “You have to consider the political landscape. The number-one question we should all have, is why do people hate us? Why is there a faction of people in the world so against what we stand for?” He has also likened the idea of blaming all Arabs and Muslims for terrorism to “blaming Americans for Timothy McVeigh.” Suffice it to say, these are not the political views of those currently holding power in the Knesset. Steve Kerr, without fanfare and without a bullhorn, walks in the path of the late Dr. Malcolm Kerr. It’s a path that sees peace as arriving only through education, empathy, and justice. It honors Dr. Kerr’s towering memory to say, without hesitation, that David Blatt’s political compass is an unapologetic path to more conflict. Using his platform as an NBA coach to steer more people onto this path demands criticism. It’s difficult to imagine that Dr. Kerr would have had nothing to say about it, even if his son is currently dealing with more immediate concerns. 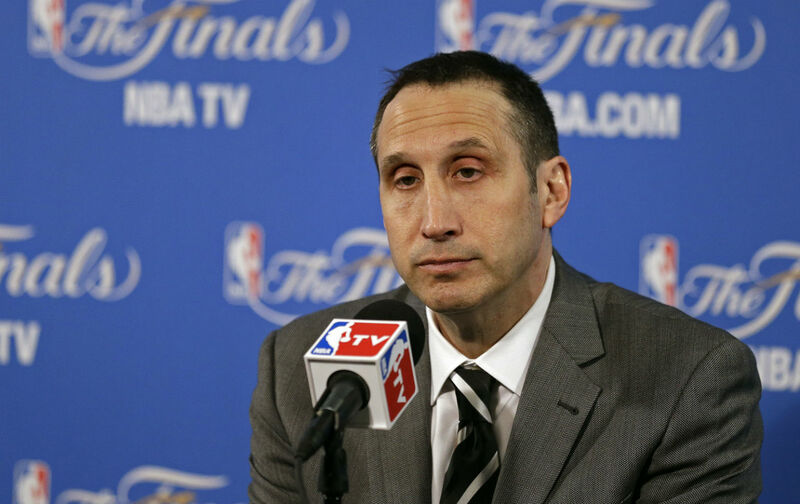 David Blatt is entitled to believe whatever he likes about Israel, Netanyahu, and war in Gaza. But it makes no sense whatsoever that these views have to be met with puffery or silence, instead of vigorous debate.